Are You Intimidated By The Cool Group? | Life Love and Hiccups: Are You Intimidated By The Cool Group? 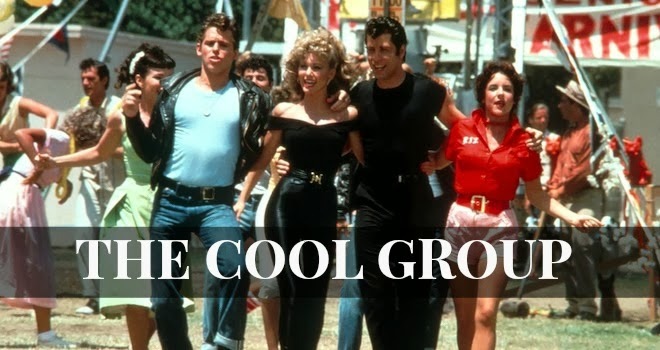 There has been loads of discussion in our house lately about 'Cool Groups'. I'm not really sure if it is because of all the American teen movies my boys have been getting into lately or if it is the fact that one of them has started High School and therefore is perhaps witnessing the natural course of social hierarchy that occurs at that age. But whatever has led to this subject being a hot conversational point right at this moment is neither here nor there, as all of us at some stage of our life will most likely find ourselves questioning the hows and whys of the enigma that is the cool group. Whether you relate it back to a time when you were intimidated by a particular group, wanted or still want to be a part of one, or you are simply curious to how they tick - there is no denying that 'cool groups' generally evoke some kind of emotional response, be it good or bad. When I was in high school, the cool kids both excited and terrified me. They were the group of older kids that sat perched on the hill and you hated having to walk past them because one of three things would happen... you would be ridiculed and forced to drop your head and get away from them as fast as you could for the sake of your dignity, if you were lucky one of the nice ones among the group would call out to you and you would be invited to sit with them and made to feel special, or possibly the worst case scenario was that you would be completely ignored and made to feel not worthy of their attention at all. Even as a grown up, I'm aware that 'cool groups' definitely still exist. The more grown up versions can be found pretty much anywhere, the bar, the beach, outside the school gates at pick up time and as a group together they seem to have this undeniable confident glow, something that can be very tempting to want to be a part of. Unlike in high school I don't think there is so much of the nasty game playing any more, although that's a very wide statement so I could very well be wrong in some cases. So why is it that wherever I go there is always a crowd that I would be just as nervous of approaching today as I once was with the group on the hill in high school? I have spent a bit of time thinking about this lately as I prepare to navigate my way through this subject with my own kids. I'm a fairly confident individual, successful enough in my own right and pretty much secure in who I am, so why should I feel intimated by any group at all? There lies the answer - for me it is the group part that scares me the most and quite possibly most of us. It is the fear of rejection upon approaching a group or a fear of not belonging or fitting in. People grouped together always look tighter, almost clique like and I think that's the bit I find more intimidating more than any coolness factor of the people within the group. Truth be told I would find approaching a group of non-coherent stoners at the skate park just as intimidating as I would approaching the trendy hipster crowd at a beach side bar. In fact I think approaching any group of people on my my own is completely intimidating. If you were to pull the 'Cool Group' from high school or from anywhere aside and dissect the group as individuals, I'm guessing you would find that maybe 5-10% are assholes who think that by hanging with someone they think is cool makes them cool by association, and the other 90% are just everyday awesome people to happen to be hanging out with other like minded awesome people and don't even realise that people view them as cool. They are flesh and blood like you and me, they too need to wipe their bums and get spinach in their teeth and they most likely share the same insecurities as we might do. The fact that they wear the right clothes, hang out at the right places and use the right words doesn't make them any cooler than the next person, it's how they treat the people outside of their group that really makes them cool. And so my advice to my kids and to myself for that matter is to forget the 'cool' bit about any group and focus on getting to know people as individuals rather than who they are when they stand together. Running within any particular crowd doesn't make you cool, and if it is a sense of belonging you are after then form your own group of friends with common interests rather than just trying to hang out with a group that you think look like fun or hope will bring you some credibility. And remember that the coolest people are the ones who make others feel welcome, who notices the person standing on the sidelines and invites them to join in rather than being exclusive. I'd rather be that kind of cool person than hanging with an in crowd and simply being cool by association. What's your take on Cool Groups? Were you or are you a part of one or had an experience with one?